Address: 115 Ng Dinh Chieu - Ham Tien - Phan Thiet , Vietnam. Located in a convenient location - Located on the main road Nguyen Dinh Chieu Street, the downtown luxury resort with the goal of building the hotel is good service, reasonable prices to create a real sense comfort, convenience, customer satisfaction by the professionalism and hospitality of the entire hotel staff. 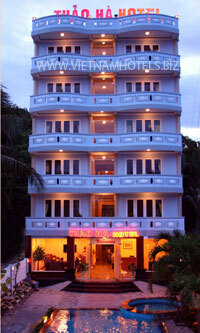 With the number of 44 rooms with luxurious interior, complete furniture, comfortable, cozy decorated, elegant. All rooms have balconies overlooking the beautiful Mui Ne beach, Seaview rooms are particularly attractive when space in the fresh air, quiet. Especially at the hotel also has bar and restaurant with traditional dishes like : Hanoi Pho, Bun Cha Quat, Nam Dinh Pho .... Went into the thought of that when visitors have been enjoying will not forget the taste of hard to describe it. We hope and trust, this place will become a reliable address, an ideal stopping point for travelers in the domestic and international. Wishing you a fun vacation, happy.